This is a photo of me several feet above the water flying on a large tube. 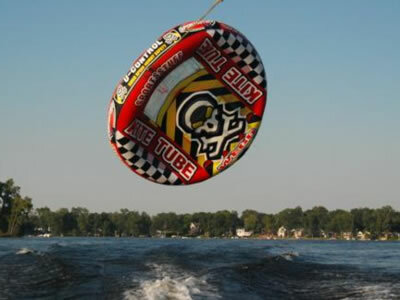 Pulled with a strong boat at 25 to 35 miles per hour, the tube will fly above the water. Since there is no wing or rudder, a proper flight depends on keeping relaxed and centered. I became uncentered once or twice only to be violently slammed into the water, adding to the fun. Surprisingly, these flying tubes were pulled from the market due to severe injury and death resulting from improper usage. In my experience, a little common sense goes a long way towards safety so if anyone knows where to get one, please let me know.